Royal Queen Seeds - Speedy Chile FAST VERSION. Free US delivery. Speedy Chile is a cross between Green Poison and Chile Indica, and it has an outstanding taste and a relaxing high. Green Poison is an elite clone that has earned a reputation for producing medical marijuana flowers of the highest quality. The potent Green Poison is ideal for pain, sleep issues and is a natural appetite enhancer. The indica also lends a nicely relaxing feel to the finished buds, making Speedy Chile ideal for those who enjoy smoking all day long. 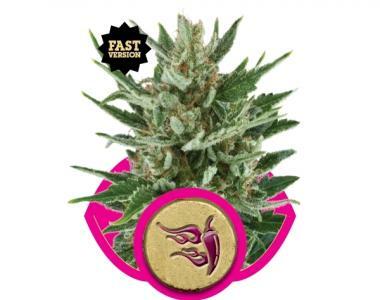 Speedy Chile feminized seeds have a fast life cycle, so you can harvest great buds in as little as eight weeks. The quick flowering strain is one of the fastest on the market, and the genetic makeup is ideal for those who want to maximize their growing area with quick turnaround times between crops. Speedy Chile seeds are an excellent choice for indoor or outdoor gardeners, and the plant is perfect for beginners and experts alike. Beginners will appreciate the fact that Speedy Chile requires little care, and experienced growers can dial in their nutrients and work wonders.